The Hyundai Sonata has been offered as a midsize family sedan since 1989. Designed by world-renowned automotive stylist Giorgetto Giugiaro, the Sonata had a distinct styling from other vehicles on the market from the very beginning. It is the Korean automaker’s longest running nameplate, and has been one of the best-selling vehicles in the Hyundai lineup since it’s introduction to the market. The Hyundai Sonata has been completely redesigned for the 2015 model year, featuring a new design, new standard features, and better overall quality. The award-winning sedan is one of the best selling cars in America, and for good reason. Not only is the 2015 Hyundai Sonata affordable, it also gets incredible fuel economy, and a completely updated interior cabin. Drivers have ultimate customization options by choosing from three different trim levels, all which are affordable and come with impressive standard features. The 2015 Hyundai Sonata isn’t just an impressive looking car, it is also an award-winning sedan. Featuring more awards and accolades than any other car in its class, the Sonata is breaking segment expectations by delivering a high-quality, affordable driving experience, that goes the distance with excellent fuel economy. The 2015 Sonata is not new to the award-winning circle. It has a multitude of other awards and recognition that date all the way back to 1989, when the sedan was first brought to the American automotive market. The Sonata has always featured enough seating for five passengers, but the all-new 2015 Sonata leaves those five passengers with much more room to stretch out. Thanks to the larger dimensions of the mid-size sedan, drivers and passengers will experience comfort like never before when they experience the interior of the 2015 Sonata. The 2015 Hyundai Sonata has so much extra room, that it has been designated as having class-leading space. The Sonata features more passenger and total interior room than any other midsize sedan. Not only can the Sonata more comfortably seat five people, it can also accommodate all of their luggage. Just in case the class-leading interior space isn’t enough, passengers will enjoy a more comfortable ride with the class-exclusive rear side sunshades. The built-in sunshades are integrated into the door panels, providing the perfect size cover for the entire window. Adult and children passengers alike will appreciate this feature, that can easily be raised and lowered by hand. 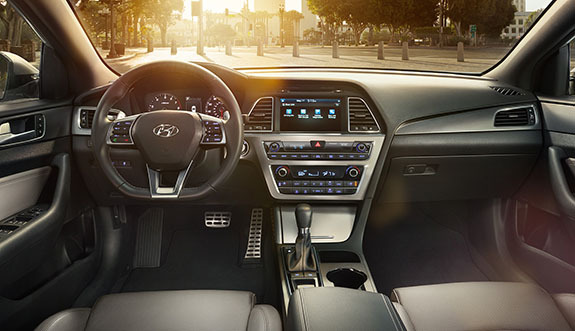 The 2015 Hyundai Sonata’s new interior updates offer drivers and passengers more flexibility than ever before, and looks stylish while doing so. The 2015 Hyundai Sonata is not a “one-size fits all” vehicle. In fact, it is quite the opposite. Drivers are able to choose from three different Sonata models - the SE, Sport, or Limited. Each one comes in at different price point levels, and feature a unique list of standard and available features. Check out what each model brings to the table, and decide which Sonata is the perfect fit for your lifestyle. SE - The base model of the Sonata, has the lowest starting MSRP of $21,150. The affordable price tag lends itself well to those who want a quality-made car with higher-end appointments, without breaking the bank. Where most other auto-makers cut costs on the base model, Hyundai does not. The Sonata SE features quality materials and an impressive list of standard features for the cost. Check out some of the highlights included on the 2015 Sonata SE below. Fuel Economy - An impressive 25 miles per gallon in the city, and 37 on the highway, the Sonata SE will get you where you need to go, with fewer stops at the gas station. Power & Performance - The SE comes standard with a 2.4-liter FWD engine with 6-speed automatic transmission with SHIFTRONIC technology. Sport - The 2015 Sonata Sport is the middle-of-the-road model in terms of price and standard features. The Sonata Sport has a starting MSRP of $23,175, and features a combined fuel economy of 28 miles per gallon. The Sonata Sport comes standard with the same engine and drivetrain as the base SE, but comes standard with 17-inch ten-spoke alloy wheels, rather than the SE’s 16-inch alloy wheels. Safety - The Sonata Sport offers drivers the same standard safety features as the base SE. The Sport also includes a rearview camera as standard safety equipment. Limited - Starting at $26,525, the Sonata Limited comes in well under $30,000, and offers drivers more standard features than any other model. Featuring the same power, performance, and engine as the other two Sonata models, the Limited has a long list of extra amenities the two other models simply cannot offer. Safety - The 2015 Hyundai Sonata Limited offers the same great list of standard safety features of the SE and Limited, and also incorporates blind spot detection with rear cross-traffic alert and lane change assist, for the ultimate in safety.